There is much more to Wilkie. He was an idealist. A war hero. A devoted friend to many and a loving family man. The five James children had an unusual upbringing. On inheriting a vast fortune, the patriarch of the clan devoted most of his time to intellectual pursuits. (His circle of friends included Ralph Waldo Emerson and Henry David Thoreau.) James provided an informal education for his children consisting of lessons taught by a succession of sometimes eccentric tutors, interrupted by frequent trips to the museums, art galleries, and cultural centers of Europe. Shortly before the outbreak of the Civil War, Henry James Sr. enrolled his two youngest sons, Wilkie and Robert, in Franklyn Sanborn’s Concord Academy. Henry James Sr. approved of Sanborn’s educational ideas and admired his opposition to slavery. A close friend of radical abolitionist John Brown, the schoolmaster was one of six people having advance knowledge of Brown’s 1859 raid on Harper’s Ferry. The unsuccessful attempt to instigate a slave uprising ended in Brown’s capture by a U.S. Army officer named Robert E. Lee. Brown was tried, found guilty, and executed by hanging. Two of John Brown’s daughters were students at Concord Academy when Wilkie and Bob arrived in 1860. War broke out in 1861. Fired by the fervent anti-slavery climate of Concord Academy, both Wilkie and Bob enlisted in the Union Army. Wilkie enlisted in 1862, the same year the North reluctantly allowed black Americans to join the military – on the condition they served under white officers. Both Wilkie and Bob volunteered as officers in black regiments. This did not make the boys universally popular. Racism was common on both sides of the Civil War. White officers assigned to lead black regiments faced ridicule, even outright hatred from civilians and fellow soldiers. It was also a decision that carried added risk, for white officers of black regiments were, by order of the Confederate Congress, to be executed on the spot if captured. On July 16, 1863, the 54th Massachusetts first encountered Confederate troops and succeeded in driving off a squadron of rebel cavalry after a sharp fight near Charleston, S.C. 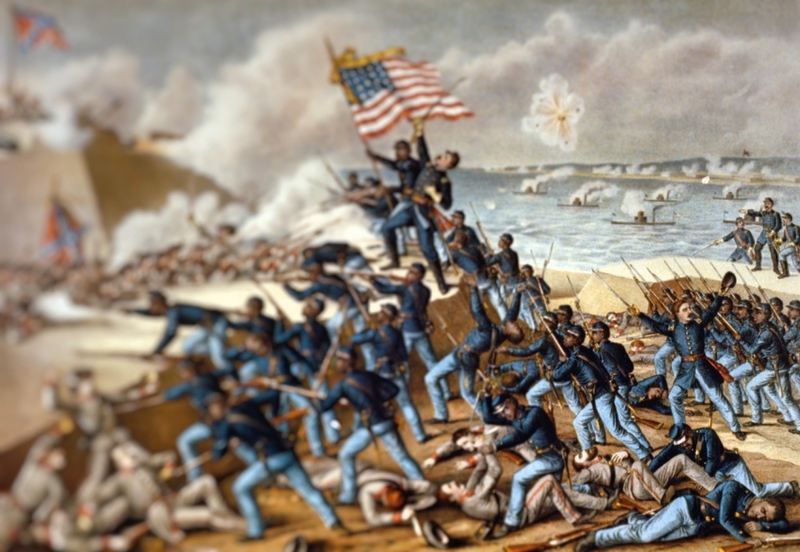 The clash was significant because the much-despised black soldiers saved an all-white regiment, the 10th Connecticut, from near-certain annihilation. Canister rounds were one of the most feared weapons of the Civil War. As troops approached, artillery gunners would fire rounds of densely-packed .69-caliber lead shot, effectively turning the cannons in gigantic shotguns. The last thing Wilkie recalled before losing consciousness was a fellow soldier, his lower jaw shot completely away, who dragged himself to Wilkie and hovered over him with his blood pouring down on Wilkie’s face. Wilkie woke up the next morning, three miles away, lying on the ground among hundreds of wounded and dying soldiers in an improvised field hospital, where a handful of medical professionals and civilian volunteers struggled to save who they could. Harriet Tubman was among the volunteers at Morris Island. An escaped slave who returned south time and again to lead more than 300 slaves to freedom, Tubman served the Union Army as a cook, nurse – and spy. On June 2, 1863, she guided 150 soldiers and two gunboats on a route she had scouted up the Combahee River. The raid freed 727 slaves, burned several plantations, and captured Confederate supplies. It was the first time in American history a woman – and a civilian at that – planned and carried out a military operation. Clarissa “Clara” Harlowe Barton also served at Morris Island. A young patent office clerk in Washington, D.C. when war broke out, she was one of the Union’s first civilian volunteers. She organized donations of supplies, prepared food for the soldiers, and tended to the wounded – often rushing in while the fight was still raging. 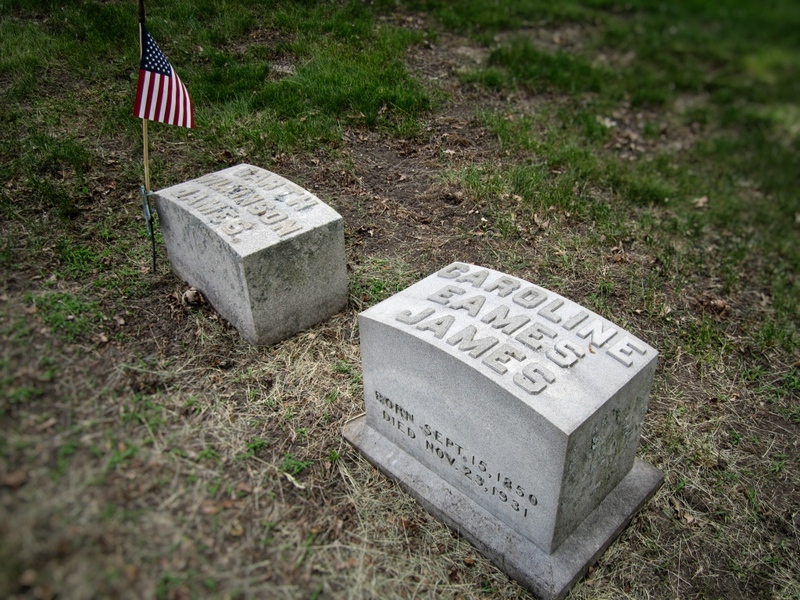 At the Battle of Antietam, a bullet passed between her arm and her body, tearing a hole in her sleeve and killing the soldier she was tending. She made a point of never patching the bullet hole in her garment. Another time a shell blew in the door of the room she in which she worked. She carried on as though nothing happened. In 2016, it was announced former slave Harriet Tubman’s image would replace that of Andrew Jackson – himself a slaveholder – on the U.S. $20 bill. Clara Barton went on to establish the American Red Cross. Just one more of the endless wounded on the sands of Morris Island, Wilkie was oblivious to all this. A massive infection had set in and he probably would have died there had it not been for a family friend, Cabot Russell, who came across Wilkie while searching the hospital for his own missing son. When his search proved unsuccessful (his son, he later learned, had died in the initial assault), Russell returned to Massachusetts with Wilkie in his care. On the trip home, a naval surgeon finally removed the canister shot embedded in Wilkie’s shattered foot. The injury would cause him lifelong pain. Wilkie had a prolonged and slow recovery. Although he could have resigned his commission honorably, he insisted on rejoining his troops in the field. After re-injuring his foot in a fall, and after another lengthy recovery, he was appointed aide de camp to General Gillmore and promoted to the rank of Captain. Wilkie and brother Bob suffered greatly in the war (Bob had nearly died of sunstroke while campaigning in Florida). The physically disabled Wilkie and his emotionally scarred brother had trouble finding jobs in Massachusetts when the war ended in 1865. Bob, through a family friend, eventually landed a position with a railroad in Iowa. With Wilkie in need of an occupation, Henry James Sr. offered to bankroll the purchase of land in Florida and place Wilkie in charge. The idea was to establish a large farming operation to provide employment for newly freed slaves. It wasn’t entirely altruistic. The Jameses, like many Northerners of the time, snapped up cheap land in the devastated south in the expectation of vast profit. But crops were poor. Wilkie knew little of farming and was unprepared for the hatred he encountered from the region’s long-time white residents. Finally, land values plummeted and the James’ family investment ended in ruin. Bob, troubled and restless, had joined Wilkie in the Florida venture for a time, then moved on again, ending up in Milwaukee working for the Chicago, Milwaukee & St. Paul RR. Wilkie, at loose ends, joined his brother in Milwaukee and went to work for the same railroad. In Milwaukee, both men fell in love and married woman of prominent local families. Bob married Mary Lucinda Holton, daughter of Milwaukee businessman Edward Holton, in 1872. Wilkie married Caroline “Carrie” Cary, daughter of prominent early settler Joseph Cary, in 1873. They had two children: Joseph and Alice. Wilkie quit his job and started his own business supplying railroad construction materials. He and a partner had close ties to influential people in the Milwaukee Road and the company’s success seemed guaranteed. However, a nationwide financial panic wiped out the fledgling company and with it Wilkie’s savings. He had even borrowed against his life insurance policy. He was also, although his brother was unaware of it at the time, increasingly ill. His wartime injury continued to trouble him and he seriously considered having his leg amputated. Other aches and pains developed and worsened, followed by a heart condition. Finally, a doctor diagnosed Bright’s disease, a then-untreatable and fatal kidney ailment. Wilkie died on November 15, 1883. His passing did not go unnoticed. The New York Times ran an obituary, as did the Boston Evening Transcript. Wilkie was 38 when he died. He left behind a wife and two children, aged 7 and 9, and a staggering amount of debt from his failed businesses. As his brother noted, Wilkie was not a success, as success is measured in this country. But there are other ways to gauge a man’s worth. Many of the facts in this article are taken from “Biography of Broken Fortunes,” by Jane Maher, Archon Books, 1986. Thanks to the author of the I Heart Literati blog for suggesting this topic. Thank you for your Milwaukee Notebook. I’ve enjoyed reading some of the hidden history of the region. I do need to go back and visit some of the topics you’ve presented. William James was the eldest son and Henry was about a year younger. William was born in January, 1842 and Henry in April, 1843. This factual error should be corrected. This post was edited to correct an error in the birth order of Wilkie’s two oldest siblings.